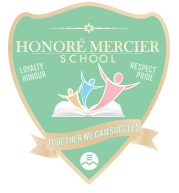 Parents who are interested in registering their child(ren) at Honoré Mercier School should contact us for information about eligibility and programs. Honoré Mercier also registers new students throughout the school year, however, acceptance depends on classroom availability. Honoré Mercier School is a secure building. To ensure the safety of our students and staff members, all visitors must be buzzed in at the front door and report directly to the main office to receive a visitor's badge.